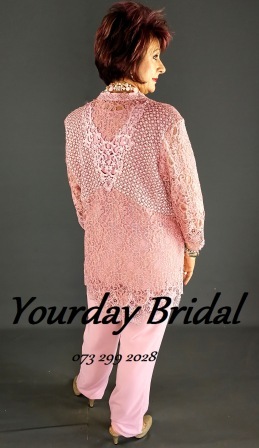 3 Pce slack suit in dusty pink pink size 42 in stock at Yourday Bridal for mother of the bride or groom. Can be ordered in different sizes and colours, delivery time 4 weeks. Make this unique designers outfit your own by visiting Yourday Bridal at 104 Willem Botha Street, Eldoraigne, Centurion.